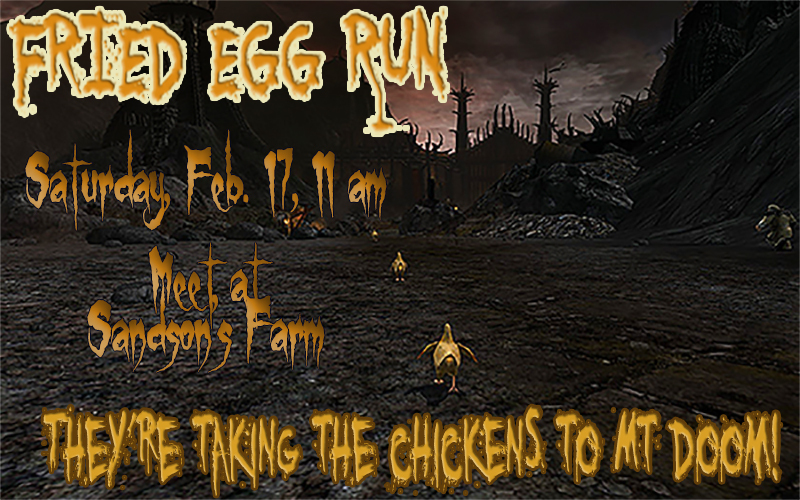 Hologro from Courserrim will be holding a Green Eggs Camp Feb 10th at 11am /ST for folks who need the preliminary adventures of chickens done so they can take a chicken to Mt. Doom. The Mythgard folks will be holding a Chicken Run to Mt. Doom the following Saturday, also starting at 11am. They will be streaming it, so their Discord channel will be used. I am still awaiting word of a link for the channel and will post it once I have it. I think Hologro mentioned it will take about 5 1/2 hours at minimum. Anyone who wishes to attend either of the above is welcome. Hologro could use a Tender or two if anyone is available. Any and all Tenders available for the Mythgard run, regardless of at what point in the run, are welcome as well. Don't forget, the Fried Egg run is this weekend.